Some auto and sports car enthusiasts will insist and swear on their life that the sports car that got it all going in America was the Mustang. After all the Ford Mustang was fast cheap and popular and got the whole “Muscle Car” era going. On top of that they may insist that if there were no mustang there would have never been any Camaro or the other whole host of “Pony Cars” It may well be true that buyer demand in the muscle car market segment had been and was created largely by the Mustang car but actually this had all started long before the Mustang ponycars arrived on the American automotive landscape. Interest in sporty ,close-coupled compacts that could seat two comfortably as well as four in a pinch goes all the way back to 1956. 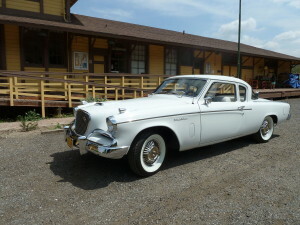 That was the first year when Studebaker fielded its first “Hawks” – nimble, fast road machines that looked different and performed considerably better than the average family sedan. Then later in 1958, Ford punched out its two-seat Thunderbird out to a four-seat configuration which also introduced a radically new body design that met with overwhelming acceptance. To the response, the dominant American automotive manufacturer replied with the Pontiac Grand Prix in 1962 as well as the stunning four places Buick Riviera the following year. 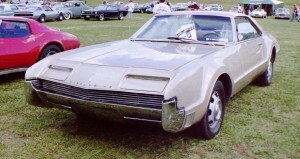 Similar concepts followed in the wings such as Oldsmobile’s Toronado in 1966. The race was now fully on and underway. 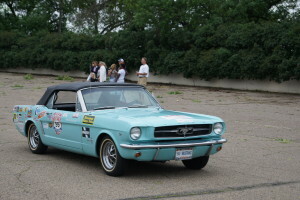 Until Mustang however, four seat “personal” cars had been mainly upper-price luxury models which were not affordable by the masses of car buyers. This was especially true for young men just starting out with their work careers or working part time after school. However it was not only Ford that was eyeing and evaluating of what became the Mustang’s appreciative and enduring target market. 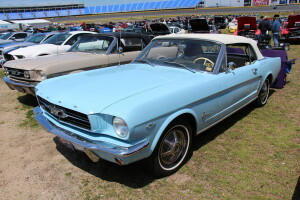 Stylists, engineers and the marketing crew were thinking about some car product in the lower-price segment and class a good six years before the Mustang made its entry and debut in 1964. In the end the fly in the ointment of this project to bring a similar automotive product to market was a lack of real corporate interest. Talk about opportunity lost and not seeing the trees from the forest – or in case the highways and interstates from the roads. Interestingly enough G.M. had missed the boat when it failed to notice the excitement by the general public of its accidental development of an inexpensive “Sports Car” to the American automotive market. It can be said that the first low priced “personal” car was the Chevrolet Corvair. Chevrolet had subtly introduced bucket seats to its Corvair sports coupe in the 1960 model year. 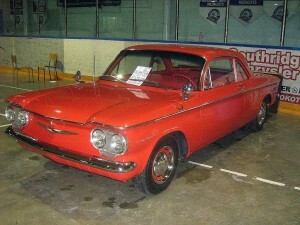 Compared to its other lineups in its stable the Corvair sports coupe sold like hotcakes. The expression regarding the sales of Mustangs was they sold like donuts, Corvair sports coupes sold like hotcakes. The offering was a hot product – a real eye popper. These cars were offered in color-keyed interiors, the trademark comfortable vinyl bucket seats and in the 1961 model year the option of a fast four speed gearbox. The marketing message may have eluded General Motors and their top executives but it sure was not lost on their competitors. Ford and Chrysler, both taking the cue rushed to equip their similar products in a similar way. 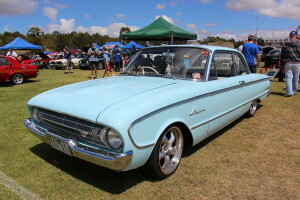 For the Ford Motor Company it was time to dress up their “compact “car the Ford Falcon. In the case of Chrysler the Valiant line got the treatment. The Mustang was not the first of the “Pony “muscle cars. Indeed Ford was even the originator of the concept. The concept and market did not originate overnight. While it took time for fruition it was Ford’s fortune of both bringing the product to market. The lessons may have been lost to others but Ford was both focused enough and nimble enough to accomplish the task. 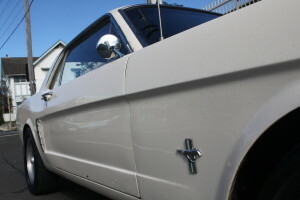 In terms of absolute cars sales the Ford Falcon based Mustang cars sold 100,000 units in their first month and a full million cars in their first year. What an auto sales record and accomplishment.